We have been hard at work expanding our CHEMSET Epoxy Enamelling range ready for the Christmas season. Hot off the press are our new Enamelling Gift Packs. Great for stocking fillers and all ready for the novice to embark on a new venture. All you need to get started is a pendant blank, a picture (or other memorabilia) and some accurate scales. The first pack to be launched is the Epoxy Enamelling Gift Pack. Based on the popular CHEMSET ES 8103 Low Viscosity Resin this is a very versatile start to the series. Each Gift Pack contains 50 g CHEMSET resin, 25 g CHEMSET hardener (with pipette for ease of use), 3 Mixing Cups, 3 Mixing Sticks and an Acrylic block. The Acrylic block has 4 drill holes added to enable the user to enamel stud earrings by placing the posts into the holes to keep them flat. The second Gift Pack in the range is based on our new Eco resin. A great addition to our product range and ideal for giving a dome effect to your piece. This resin can also be used for casting and is perfectly clear for making beautiful pendant keepsakes. 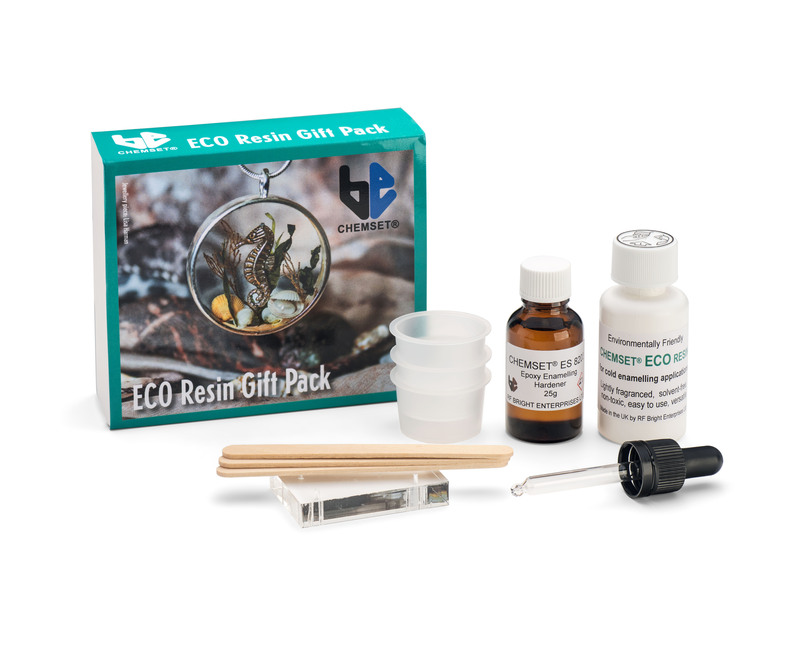 The contents of the Eco Resin Gift Pack are the same as in the first Gift Pack but with the resin replaced with our ECO blend.